Copyright: © 2017 Salmi A. This is an open-access article distributed under the terms of the Creative Commons Attribution License, which permits unrestricted use, distribution, and reproduction in any medium, provided the original author and source are credited. Oral anticoagulants are usually prescribed for various indications. Their wider use has been noted in recent years, probably exposing more frequent hemorrhagic complications. If, typically, the bleeding is digestive, genitourinary or intracranial, the epidural hematoma, exceptional or even underestimated localization, is rarely reported in the literature. It is characterized by its diagnostic problems on the one hand and by the possible evolutionary complications, in case of late management. Spinal imaging, CT scanning or magnetic resonance imaging (MRI) are very interesting diagnostic tools. A young 34 years old patient, treated chronically with acenocoumarol (Sintrom®) at a dose of 2 mg per day following a mitral valvuloplasty rather 3 months (St. Jude type), admitted for persistent neck pain, continuous, sudden onset, disobedient to banal analgesic. Physical examination revealed a conscious patient, febrile, without deficit signs or sensory disorders, who complained of severe neck pain, and any attempt to mobilize the cervical spine was impossible. Laboratory tests were not anomalies, outside an INR 7.The brain scan was normal. 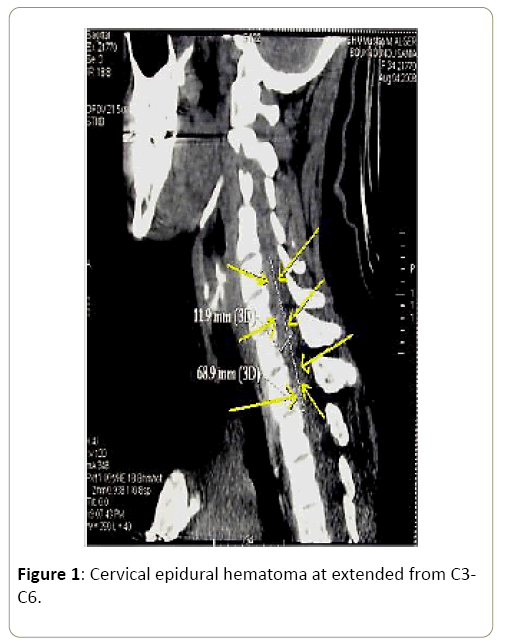 A cervical spinal cord injury was suspected and CT of the cervical spine then concluded, cervical epidural hematoma at extended from C3-C6 (Figure 1). 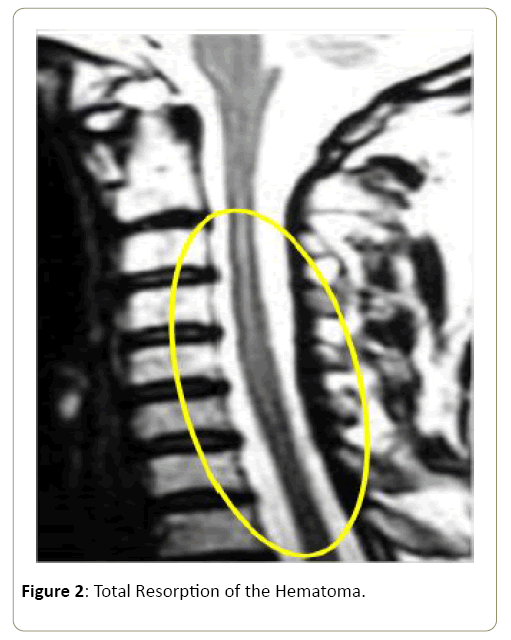 Figure 1: Cervical epidural hematoma at extended from C3-C6. All data, clinical and radiological, and absence of any notion of trauma, were in favor of a spontaneous cervical extramedullary hematoma complicating anticoagulation. Anticoagulant therapy was stopped, and the therapeutic management was symptomatic corrected INR (INR <1.5), development of a cervical neck brace for analgesic and clinical monitoring, biological and radiological. The clinical outcome was favorable with disappearance of neck pain and cervical spinal MRI performed a month later, revealed a total resorption of the hematoma (Figure 2). Figure 2: Total Resorption of the Hematoma. • 30-64% of cases, no cause is found. Conservative treatment  has been tried, and 7 cases of epidural hematoma, which resolved were identified. In our case, the treatment was based on the rapid antagonism of vitamin K antagonists to obtain an INR (International Normalized Ratio) less than 1.5 associated with analgesic treatment. The patient was referred to her treating physician for the reintroduction of her anticoagulant treatment. In these situations, it is often possible to restart the antivitamin K 2 weeks after the hemorrhagic event. It is total in 83% of cases if the deficits in complete, and in 25% of cases in the presence of a complete deficit . The perimedullary hematoma, despite its rarity as a current practice, needs special attention, since the prognosis is directly related to the therapeutic precocity. Careful interrogation and imaging are the diagnostic pillars. Hentschel SJ, Woolfenden AR, Fairholm DJ (2001) Resolution of Spontaneous Spinal Epidural Hematoma without Surgery: Report of Two Cases. Spine 26: E525-E527. Beatty RM, Winston KR (1984) Spontaneous Cervical Epidural Hematoma: A Consideration of Etiology. J Neurosurg 61: 143-148. Lin IY, Chong C (2004) Non Traumatic Spinal Epidural Hematoma Mimicking A Brainstem Stroke. Annals of Emergency Medecine 44: 183-184. Domenicucci M, Ramieri A, Ciappeta P, Delfini R (1999) Nontraumatic Acute Spinal Subdural Hematoma: Report of five cases and Review of the literature. J Neurosurg 91: 65-73. Chretieonnet-Bara C, Guet A, Balzamo E (2001) Hematome Epidural Chez L’enfant Homophile: Difficultes Diagnostiques. Arch Pediatr 8: 828-833. Cohen J, Ginsberg H, Emery D, Scwartz M (1998) Fatal Spontaneous Spinal Epidural Hematoma Following Thrombolysis For Myocardial Infarction. Surg Neurol 49: 520-523. Groen R, August H, Van Alphen M (1996) Operative Treatment of Spontaneous Spinal Epidural Hematomas: A study of the factors determining postoperative outcome. Neurosurgery39: 494-509. Hentschel S, Woolfenden AR, Fairholm DJ (2001) Resolution of Spontaneous Spinal Epidural Hematoma without Surgery: Report of Two Cases. Spine 26: E525-E527. Otsu I, Merril D (2004) Epidural Hematoma after Epidural Anesthesia: A Case Report of Non Surgical Management. Acute pain 4: 117-120. Cullen D, Bogdanov E, Htut N (2004) Spinal Epidural Hematoma Occurrence in the Absence of Known Risk Factors: A Case Series. J Clinical Anesthesia 16: 376-381.